Here, you can visit the famous surfing town of Haleiwa and browse several boutiques for one-of-a-kind souvenirs and knick-knacks. You can also watch experienced surfers hang ten on gigantic turquoise waves to compete in world-renowned surfing competitions or relax on one of the several secluded beach areas. Step off the beaten path in Waimea Valley and hike along a paved path through lush native Hawaiian gardens and greenery. 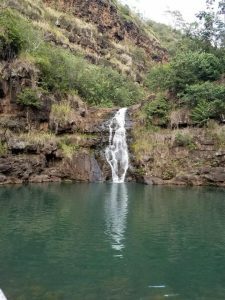 Your reward awaits at the end of the trek with the gorgeous Waimea Falls splashing into a pool of cool water suitable for swimming. Life jackets and a lifeguard are provided. Keep an eye out for native plants and wildlife as you hike and take advantage of the several epic photo op locations along the trail. After the hike, be sure to stop by the farmer’s market at the trailhead and try some of the authentic honey shaved ice, you will not be disappointed. 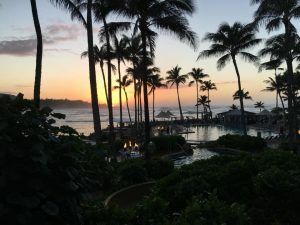 If you are looking for a resort experience on the North Shore, the pristine Turtle Bay Resort sits on the edge of Kuilima Point with a backdrop of jagged lava rocks highly-contrasted against the deep blue of the surrounding ocean. You can enjoy both sunrise and sunset from different areas of the expansive resort. A personal favorite was watching the sun sink into the ocean from the vacant lava-crusted point, surrounded by crashing waves on both sides. One of our favorite features of the Turtle Bay Resort was the private lanai overlooking the ocean. Since we traveled in January, the whales were active. There were a few mornings we sat with coffee for hours and watched the whales surfacing just offshore. Kuilima Cove is a few steps from the resort and is protected from the dangerous currents found at most of the other beaches on the North Shore. It makes for excellent swimming, sunbathing and snorkeling. The resort provides complimentary snorkel gear and towels for its guests. We utilized them daily and had the most amazing snorkel experience. On our first day, we had a lucky encounter with a sea turtle and was able to swim alongside it for several minutes. There is a reef in the center of the cove. It’s home to a variety of colorful fish and sea creatures. The food selection on the North Shore is like none other. We enjoyed mouth-watering tropical drinks, and food just steps from the resort’s beach area at Roy’s Beach House. The resort itself boasts several dining options from casual to formal. We especially enjoyed the Kula Grille and took advantage of room service a few times throughout my stay. Then, of course, there are the shrimp and other food trucks parked at various locations along the North Shore that boast a variety of scrumptious meals that you won’t find anywhere else. 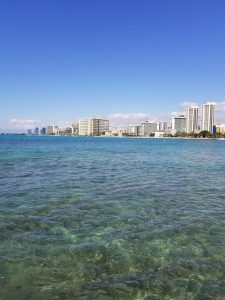 At first, we were a little skeptical that a resort so far away from the activity of Honolulu could provide the exceptional experience we were looking for. However, we are so glad that our rural roots and desire to relax away from the commotion of a city, pushed us to try Turtle Bay. 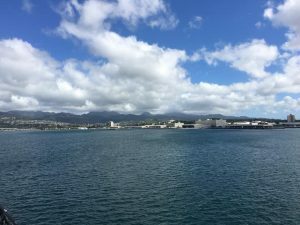 I had a spectacular stay, avoided the hustle and bustle while taking a day to tour Pearl Harbor and Honolulu. We recommend the North Shore experience to everyone.